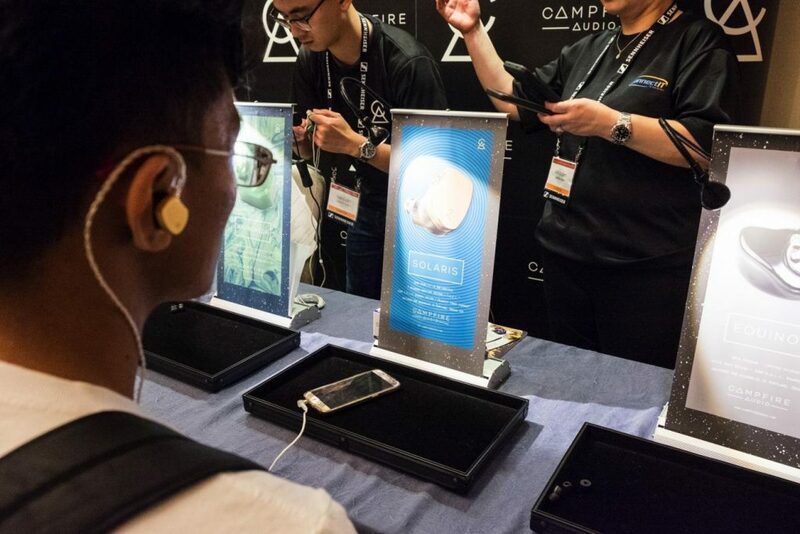 Campfire Audio were represented at CanJam Singapore 2019 by ConnectIT. Like many of the manufacturers towards the back-half of this article, they were located in the venue’s second floor. 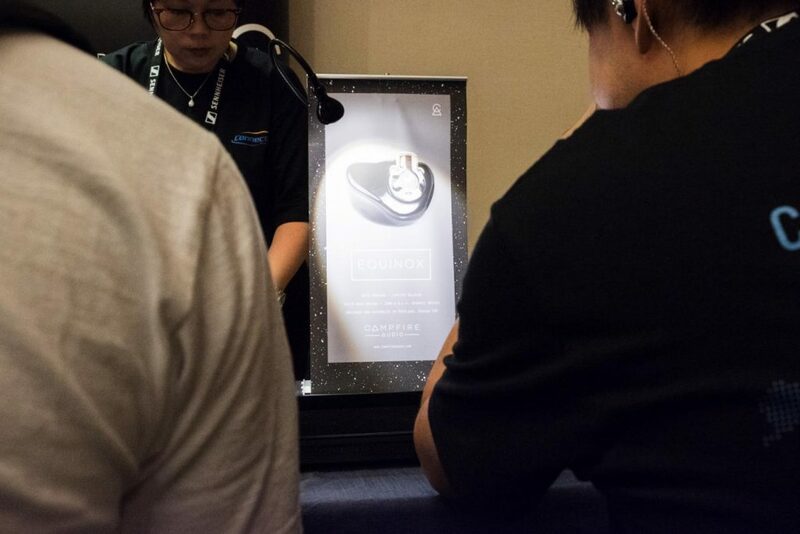 Despite the distance from the show floor, their booth constantly drew traffic – not only for the immensely-popular Solaris, but also for the Singaporean debut of their first (and supposedly, only) custom in-ear monitor: Equinox. Below are my impressions of both, vastly different in-ears. Campfire Audio Solaris: The Solaris is a fun-sounding, charismatic and tonally-gorgeous all-rounder. It’s packed with lovable musicality, clarity and air, belied by a viscerally-satisfying bass response. In many ways, it reminds me of IEMs like 64Audio’s U18t or Lime Ears’ house sound, where every sort of music sounds engaging, clean and smooth all at the same time. But, the Solaris has the advantage of a dynamic driver for its rhythmic drive, allowing it to deliver wet, meaty and naturally thump-y hits. A hint of decay musically coheres the stage together. But, sufficient swiftness – for a DD, especially – ensures zero cleanliness is sacrificed in the process. The image as a whole remains airy, open and clean. The midrange comes across well-balanced and well-defined. The Solaris projects very naturally, which I suspect is the result of a dip around 3-4kHz. Vocals are airier than they are saturated. Perhaps, I’d love a bit more chestiness to the fundamental at 1-2kHz. But, the clean, clear and open response the Solaris portrays here is very nice too. The treble – to me – is what really brings the signature together. It’s crisply articulate, but infinitely refined as well. The top-end comes across smoothly clean with bounds of headroom and air. There’s a speed to the treble that minimises bright haze from lingering around the image. Snare drums and cymbals in particular crackle excellently before vanishing without a trace. The mid-treble is a hair bright in tone, so hi-hats have a bit of a sheen to them. But, it stays well within natural territory. All in all, the Solaris is one of those sound-good-with-anything gems that I’d happily sit beside the Lime Ears Aether R, 64 Audio’s U18t and the Vision Ears VE8. If smooth, airy vocals, crackling drums and a dynamic, thunderous-when-called-upon bass is your cup-of-tea, you need not look much further than here. Campfire Audio have another winner on their hands. Campfire Audio Equinox: The Equinox possesses an exciting, bass-driven sound with a warm tone. The low-end is the dominant region, but it’s undercut effectively by the Equinox’s articulate top-end. Regardless, the treble does sit squarely behind the low-end to produce a slightly L-shaped response. Another defining characteristic is the Equinox’s laid-back upper-midrange. Vocals and woodwinds sound relaxed and timid, almost as if they were projecting whilst leaning back from the mic. The stage is impressively large, though – enough to contain all that bass power with headroom to spare. Imaging precision and stage continuity are both excellent, perhaps due to the Equinox’s single-DD config. Bass notes hit with a healthy dose of warmth; more radiant and bloomy, than tight and thwack-y. The top-end seems to peak around 6 and 10kHz for a slightly smoothened transient response. Regardless, they crackle with enough force to balance against the bass, and they provide sparkle to the midrange. So, if your preferred sig includes a strong, warm low-end, a timid top-end and potent imaging – and does not include forwardly-placed vocals – the Equinox is a potential option for you. 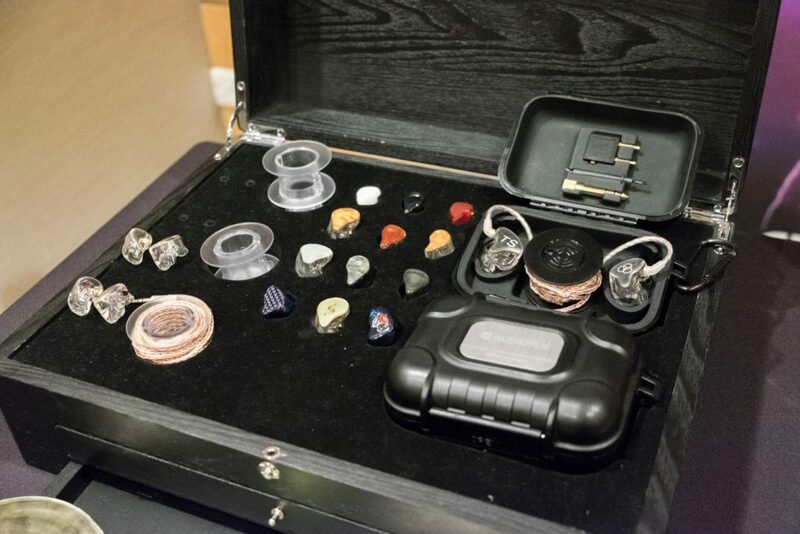 On display were demos of their custom IEM line, which to my understanding is only available in select parts of the world. 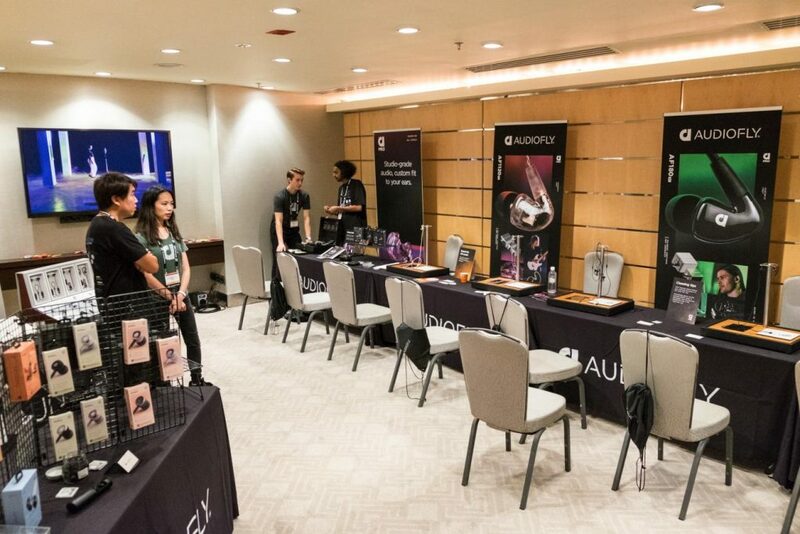 They exhibited the wide array of options available to deck out your custom set, including genuine abalone shells. And, they also showed off the high-quality wiring used for their premium cables. As the show was nearing its end, I was only able to audition their flagship, 8-driver in-ear monitor. But I must confess, I was very impressed with what I heard. Audiofly 8-BA: Audiofly’s 8-driver custom IEM seems to aim toward a reference sound signature. There’s a clear bias towards the upper-regions than the low-end. But, that’s not to say it’s top-heavy at all. The low-end is simply laid-back relative to the rest of the spectrum. But, high extension provides a sufficient rhythmic drive. Instruments down low are compact and tight, but they’re dense and solid as well. It’s a clean signature packed with air, openness and clarity. The midrange has been kept intact all the while too. There aren’t any lower-mid dips for definition’s sake. While neutral in tone, vocals maintain a natural sense of body. And, the stage nevertheless is open, clear-sounding and well-nuanced. Where the in-ear falls short is perhaps in providing a musical sense of warmth. It’s a tighter sound with compact notes set against a clean background. But, as a reference monitoring piece, I can see Auidofly’s flagship delivering for many.